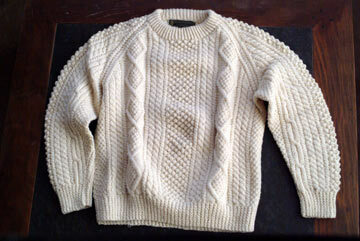 You are bidding on a white, hand-knit Irish fisherman’s sweater. Why? I have no idea. Maybe you’re an Irish fisherman and you lost your sweater. Maybe you’d like to be an Irish fisherman, freezing half to death on the Irish Sea desperately searching for herring before paddling back to your loudmouth Irish wife whose wit makes up for her large bum. I don’t know. I’m not here to ask questions, I’m here to sell my white, size 42, hand-knit Irish sweater. The sweater is in excellent condition because I don’t think I ever wore it. Why? Because I’m not Irish, nor am I a fisherman. I was simply charmed into buying it when I was over there, many years ago when I was enamored with the Irish and Guinness and thought the IRA was cool. The IRA isn’t cool by the way. They’re a bunch of thugs and if you make the mistake of inviting one to stay over he’ll camp out for two weeks, eat all your cheese and terrify your wimpy, longhair roommate. Then he’ll borrow $100 he doesn’t intend to repay, get his teeth knocked out by a bunch of Mexicans in a bar brawl and join the U.S. Army Rangers. Good riddance, Gerry. Anyway, back to the sweater. It’s white because it’s made with white sheep wool. It’s thick, so it’s great for cold weather or Bikram yoga. If you wear it with a pair of Ray Ban tortoise shell sunglasses you’ll look like Mickey Rourke in A Prayer For The Dying, a horrible film. If you don’t like white, stay tuned for more auctions. I’ve been to Ireland 16 times, and each time I came back with a sweater that I wound up storing in the closet for years. I’m that sharp. This sweater features an intricate pattern which was how Irish folks used to determine what village a drowned fisherman came from. I don’t know what village this pattern is from, but rest assured if you drown some Irishman will run there and let everyone know. Bid if you’re so inclined.